25 years ago, on November 13th, 1989, the Board of Trustees announced the College’s intention to completely divest the endowment from companies operating in South Africa. This decision was the culmination of almost 20 years of protests and discussion between students, administrators, and community members regarding the propriety of the College’s involvement with companies that were complicit in apartheid. The 1970s and 1980s saw divestment movements arise at many colleges and other institutions in the midst of the public outcry over South Africa’s apartheid system. The College’s first action regarding the divestment question occurred in 1972, when the Trustees voted to form the Advisory Committee for Investor Responsibility, tasked with overseeing the ethical use of Dartmouth’s endowment. In 1977, Rev. Leon Sullivan issued a set of six principles of business ethics for companies operating in South Africa in order to maintain their American backers. Dartmouth and many of its peer institutions pressured the companies in which they had investments to sign on to the principles. However, by the mid-1980s the principles were considered too moderate and many organizations began to consider complete divestment. 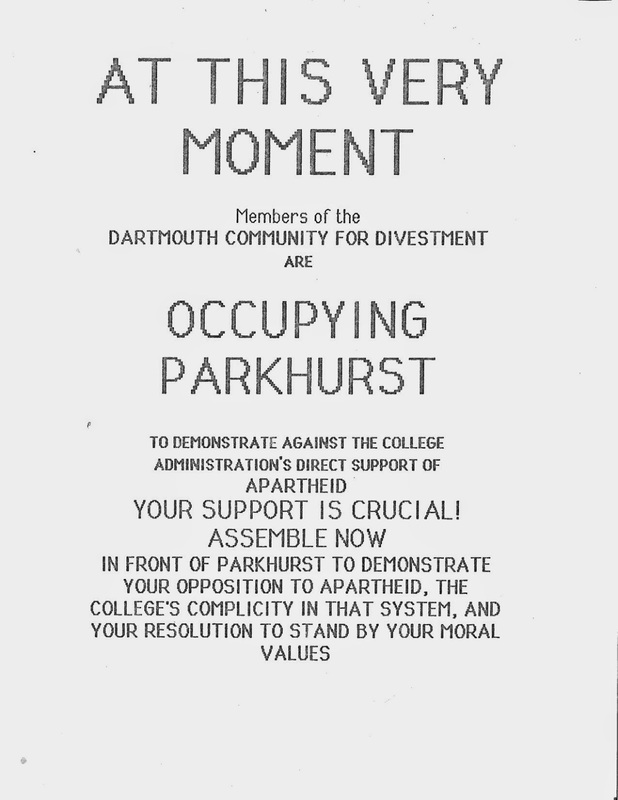 The debate over apartheid and divestment at Dartmouth included several highly controversial protests and demonstrations. For example, in 1986, 13 students occupied Baker Tower and only came down after they were promised a meeting with the Board of Trustees to discuss the possibility of divestment. The most well-known protest by far, however, concerned several shanties built on the Green in late 1985 to protest the human rights violations of apartheid and the College’s refusal to divest. Students began living in the shanties and refused to leave despite the cold weather and the administration’s disapproval, but during the night of January 21st, 1986, a group of writers from The Dartmouth Review secretly gathered on the Green and destroyed the shanties with sledgehammers. The next day, nearly 200 outraged students occupied Parkhurst and the President’s Office to protest the attack, while more students rallied outside. President McLaughlin responded by suspending the students who had destroyed the shanties and canceling classes for one day to hold a teach-in exploring racism and prejudice at Dartmouth. While the protests quieted somewhat in the following years, groups such as the Dartmouth Community for Divestment, the Afro-American Society, and the Upper Valley Committee for a Free South Africa continued to pressure the Board of Trustees to divest until 1989, when they finally agreed to do so after a group of protesters stormed a meeting of the Trustees and called for an impromptu vote. The College continued to refrain from investments in South Africa until 1994, when it chose to end the policy following the overthrow of apartheid. To learn more about Dartmouth’s divestment movement, check out the display case in Rauner's reading room, just to the right of the doors. Sources for the exhibit are the Records of the Advisory Committee on Investor Responsibility (DA-328), the Papers of George Bourozikas (DO-55), and archives files on student protests. Posted for Hillary Purcell '14.